I am not a Shakespeare lover. There you go I said it! 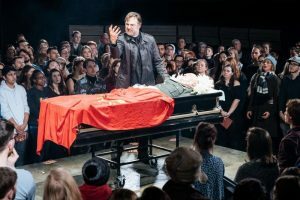 Luckily the Bridge Theatre with Julius Caesar and the immersive experience managed to win over even a sceptic like me! William Shakespeare’s Julius Caesar tells of Caesar’s return to Rome but the educated elite become worried by his rise in popularity. They decide to assassinate him but this sparks off a civil war and results in unforgiving consequences for the conspirators. 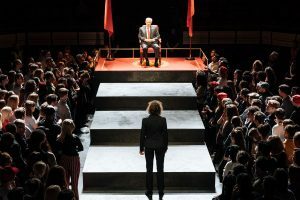 There are 2 ways to experience Julius Caesar – either sitting in the round, a traditional onlooker or by becoming part of the mob, in ‘the pit.’ I was part of the latter group and I am remarkably glad I was. A warning now – it is 2 hours straight through and I had sore feet/legs/back by the end of it, you get pushed and shoved around and sometimes you end up struggling to see…..but it is totally worth it! You really do feel as if you are part of something and it made me realise how easy it can be to get swept up in a crowd and a mob mentality. The sound design really adds to this element. You aren’t sure if it is fellow audience members cheering, cast or sound effects. In the civil war moments it really sounds like there is a battle going on all around you. This constant feeling of being surrounded by the action really helps you get swept up in the moment. The design of the show also really helped the success of the immersive element. Parts of the pit floor rose and sunk back down again depending on the setting. You never knew where the action would come from next, heightening the feeling of anticipation. Julius Caesar is set in modern dress with suits and sharp dressing being the order of the day. This combined with the current political temperature of Brexit and Trump made it feel really relevant. The acting quality on stage was top notch! David Calder as Julius Caesar had a huge amount of gravitas, causing me to flit between having a huge amount of respect for Caesar as well as being fearful for the impact he has on all of those around him. David Morrisey portrayed Mark Anthony as a bloke you may come across in the pub, but this caused everyone to underestimate him and his oratory skills. Michelle Fairley was a passionate and compelling Cassius for this gender switch up casting. 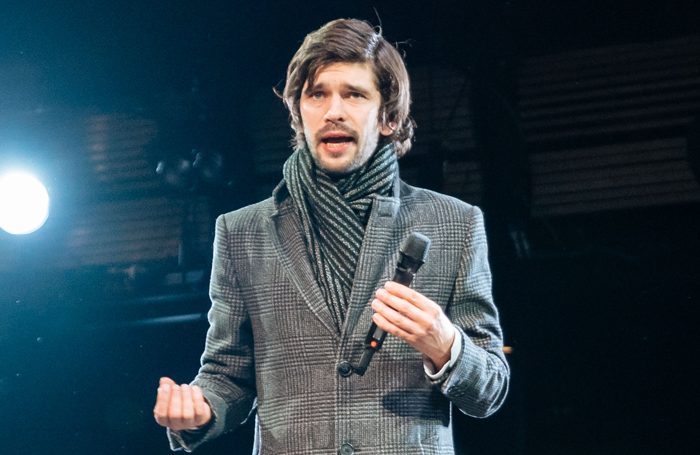 Finally Ben Whishaw as Brutus gave an intelligent portrayal of this character. He was a man caught up in his own thoughts, his intelligence helping him rationalise the murder and blinkering him to the potential outcomes. Between them and the rest of the cast they portrayed politicians in turmoil, a multitude of personalities conflicting with the other. 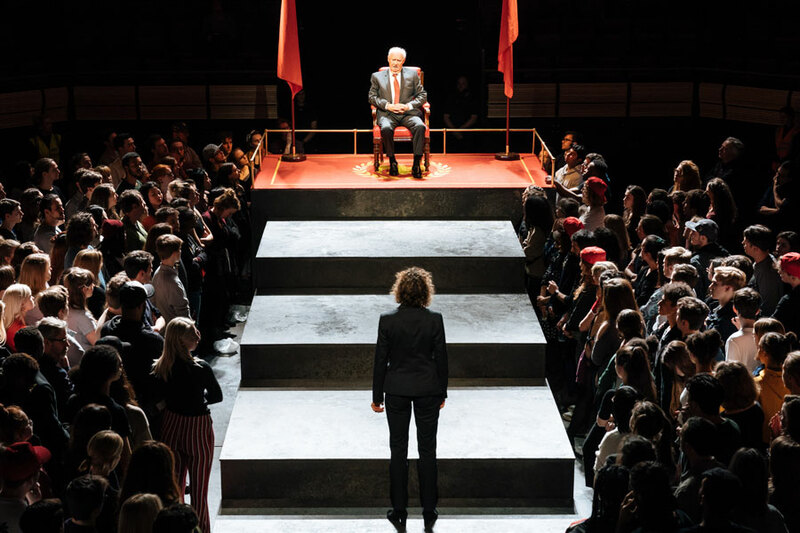 Director’s Nicholas Hytner’s production of Julius Caesar feels like it could be a new piece that is being staged, such is the relevance and excitement of this production. For those, like me, who often avoid Shakespeare, I would encourage you to immerse yourself in this fresh and anarchic version. To buy tickets for Julius Caesar then visit Bridge Theatre’s website. Standing tickets are only £25! If you liked this review you might also like my review of The Ferryman and Dear Brutus.